It’s November. That means (if you’re in the US), that you have some sort of Thanksgiving break coming up. Most people intend to do something creative and musical on their vacations, but few get around to it. Let’s change that this year, shall we? You’ve got a few weeks, but I want you to figure out exactly what you want to accomplish on your break, and make a plan (and a schedule) for how you’re going to make that happen. I’m not talking about avoiding your family for the entire break, but I bet you can sneak away for a few hours and make some serious headway on your musical goals…it just takes a little bit of intentionality. Maybe you want to finish up some mixes? Record scratch tracks for a new EP? Whatever it is, start planning for it now. 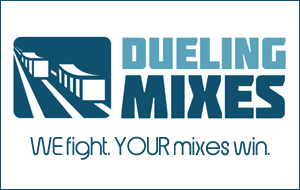 And if your plan is to get a few solid hours of mixing practice in, then sign up for Dueling Mixes now. You’ll get access to two separate songs (and tutorial videos on how Graham and I each mixed ‘em) that you can download and load into your studio. Watch the videos between now and Thanksgiving. Then mix the song(s) over your Thanksgiving break, using all the stuff you learned from the videos.